It’s expensive to buy securities that track volatility. Their holding costs are so high that your timing has to be exquisite in order to end up with a profit. However, if you’re hedging a short volatility position, or poised to jump into the general market at a possible transition point a long volatility position might make sense. Will the S&P 500 bounce off this trend line for the fifth time, or will it go into a correction? If SPX breaks through the trendline it’s likely volatility will really spike. Alternately if the market rallies then volatility will quickly fade, so an asymmetric bet (e.g., call options) is attractive. If volatility spikes you benefit from the rapid run-up, but if it’s a false alarm your losses are limited. The next question is to determine what underlying volatility product is best for this hedge and how large a position is needed to balance the risk in your general market position. 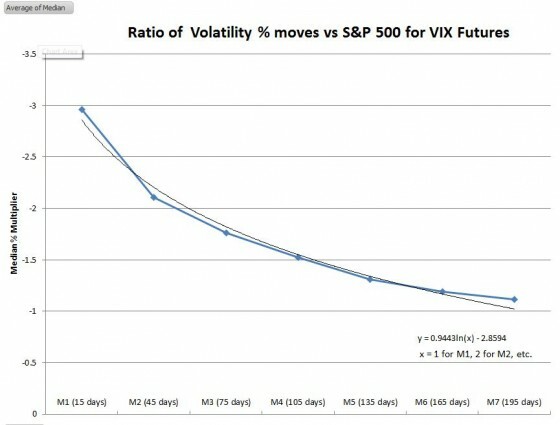 Investing in the CBOE’s VIX® would be ideal, but unfortunately there’s no way to directly invest in the VIX, so we’re left with a set of compromised choices—volatility Exchange Traded Products (ETPs) like TVIX, VXX, or VIXM (see volatility tickers for the complete list), or VIX futures. Later in this post I’ll analyze how three specific investments would have performed during an actual correction, but first I’ll examine a key issue—how much will the volatility products move up if the market drops. 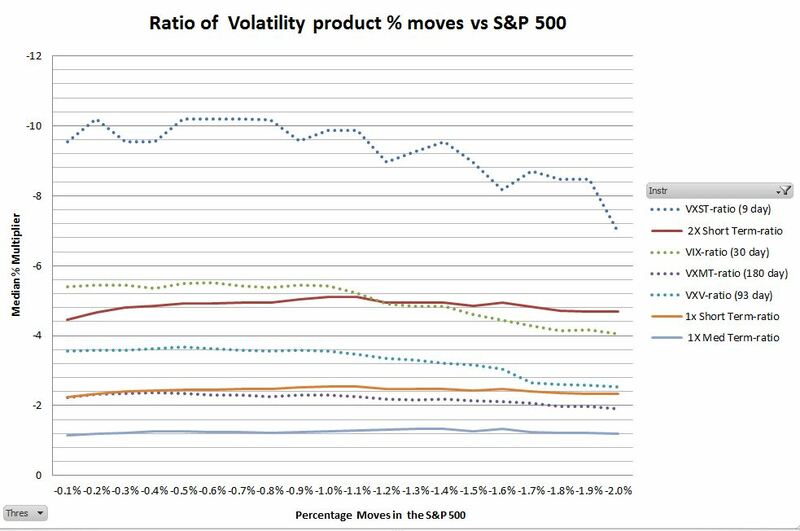 The chart below shows how the volatility ETPs have historically reacted during negative S&P 500 (e.g., SPY) market moves. The data uses simulations of ETP prices from 2004 until their inceptions and actual data after that. The median value of these ratios stays fairly stable over a wide range of percentage moves. 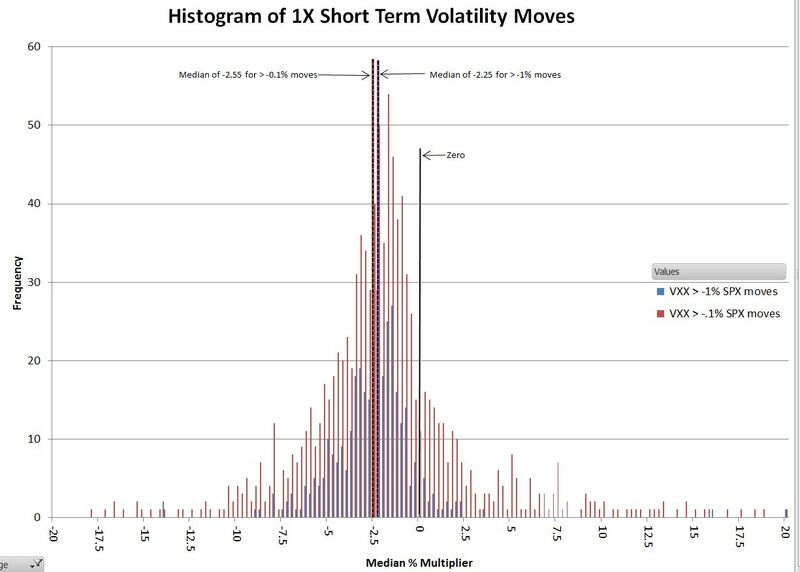 For example, the median percentage moves of 1X short term ETPs like VXX will consistently cluster around negative 2.25 times the percentage moves in the S&P. 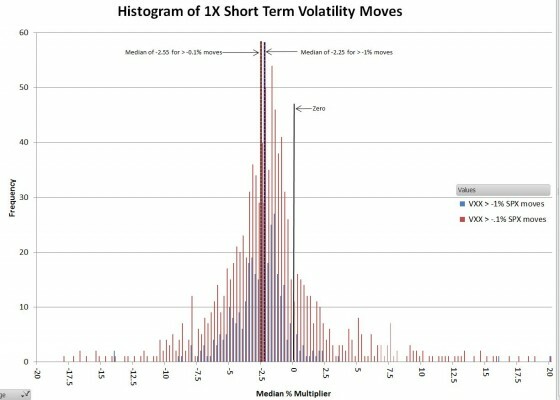 A daily -1% move in SPY typically results in a VXX positive move of around 2.25%. 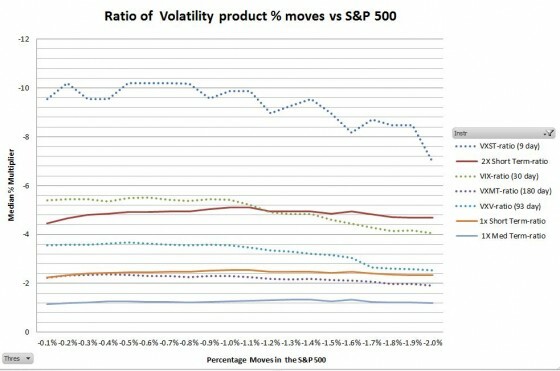 The chart below shows the historical distribution of VXX percentage moves compared to SPY moves of > -0.1% and > -1%. SPY moves of less than +-0.1% are excluded because they can generate high ratios that aren’t meaningful. When the S&P makes a 1% or larger negative move the median doesn’t shift much, but the number of results on the positive side drops from 21% of the total down to under 5%. Since these ratios are relatively stable regardless of the size of the market moves we can view these ratios vs. the various ETPs / indexes. Remember these are one day relative % ratio numbers. 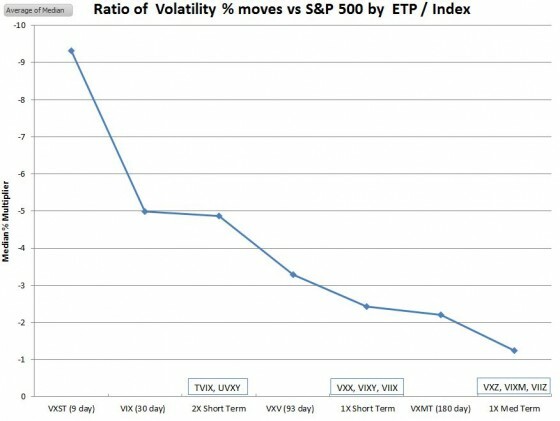 While TVIX & UVXY ratios are close to the VIX’s on this metric, the contango losses in holding these ETPs other than during a market downswing are ruinous. 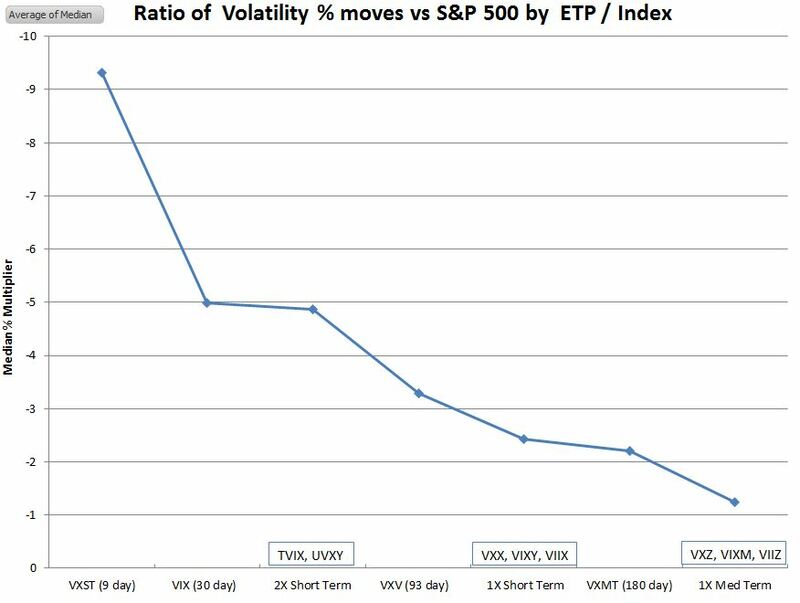 The 1X short term ETPs (e.g., VXX) aren’t much better. So far I’ve only discussed the CBOE’s indexes and some of the volatility ETPs. 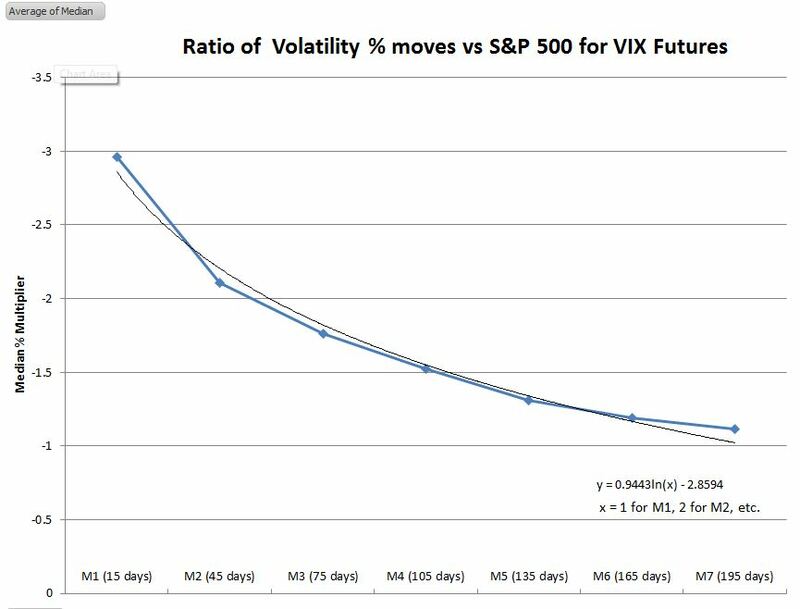 There are also VIX futures that have various sensitivities to the moves of the S&P 500. These products differ from the indexes and ETPs in that they have expiration dates like options. As these futures get closer to expiration their sensitivity increases. Interestingly, a simple natural log relationship (shown on the chart) gives a good match to the data. There are also VIX weekly futures based on the CBOE’s 9 day VXST index, but I’ll discuss those in a different post. Circling back to the trend chart at the beginning of this post—what would be a volatility hedge that would protect you if you bet on a 5th upward bounce? There’re a lot of moving parts here (e.g., security, strike price, expiration date) and a lot of different strategies. I’ll pick one general approach, and work through the details if the hedge had been applied during the 30-July-2014 through 8-Aug-2014 period. 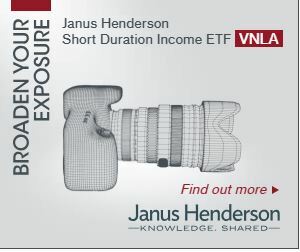 One percent of the market investment ($1K) invested in a volatility hedge—call options expiring around 16-Aug-2014. It’s very likely the market will have gone one way or the other by then. Goal of breaking even (losses in SPY & cost of the options offset by profits) if the market drops 3% or more. I’ll review the results from three different trades—buying calls on UVXY (2x Short term), August VIX calls (based on next to expire VIX futures or M1 futures), and VXX (1X Short term). So, in spite of the underlying volatility instruments moving around 2X more than expected, the $1K spent on hedges did not achieve the goal of break even with a 3% decline in the S&P 500—although UVXY was pretty close. During this period the VIX ramped from 13.33 to 15.77—an increase of 18.3% (the expected move was 15%). If the correction had continued volatility would have probably increased rapidly (the intraday option prices spiked > 50% on the 8th –when the VIX climbed to 17.09), so the hedges probably would have worked well protecting the S&P 500 position against further declines. One of the challenges of trading is wrestling with strategies that work until they don’t. With short term volatility hedges you can bet on the market going up—without paying too much for insurance in case you’re wrong.